This Note is part of a series of Notes on key City issues to update City Council at the start of its 2018 – 2022 term. As the primary destination for immigrants to Canada, Toronto also receives the highest numbers of arrivals in classes that have more complex needs, such as refugees and refugee/asylum claimants. The City of Toronto has responded to this most recent increase in refugee/asylum claimant arrivals in a coordinated and effective manner. City Council authorized increases in the last two operating budgets to help address the immediate needs of refugee/asylum claimants coming into Toronto. Additionally, Council has requested the federal and provincial governments to reimburse the City for those costs associated with the City’s response. To date, the Federal Government has provided $11 million of a total projected cost of over $64.5 million, while the Provincial Government has contributed $3 million as committed earlier this year. Since late 2016, the City has successfully housed over 4,300 refugee/asylum claimants across the city. Over the last four years, the City has added more than 2,000 beds to accommodate increasing pressures across the emergency shelter system. Despite these successes, inflows to the shelter system continue to outpace outflows. City staff continue to engage with other governments and community partners to coordinate a response that addresses the needs of new arrivals as well as existing families and people in the system. While immigration policy is under the federal and provincial jurisdictions, it is municipal governments that respond to fluctuations in new arrivals and provide services. City Council has committed to providing municipal services to all Toronto residents regardless of immigration status. Resettled refugees are selected and processed overseas and arrive in Canada as permanent residents. For example, the City’s Refugee Resettlement Program, implemented through the City’s Newcomer Office facilitated the successful settlement of close to 7,000 Syrian refugees by facilitating the coordination of internal and external services. Refugee/asylum claimants, however, apply for refugee protection from within Canada. Currently, it takes 20 months on average before they receive a first level decision. Refugees and refugee/asylum claimants have unique needs, depending on factors such as country of origin, language proficiency, health, and other factors. 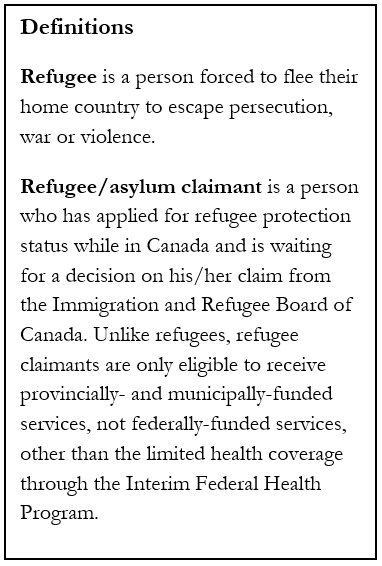 Refugee/asylum claimants, in particular, are generally an under-served, vulnerable population with high needs. The City has requested that the Federal Government speed up processing times for claims, extend eligibility to receive settlement services to refugee/asylum claimants and provide increased support to municipal governments and community partners who work to provide settlement services. Source: Asylum Claimants Processed by Canada Border Services Agency (CBSA) and Immigration, Refugees and Citizenship Canada (IRCC) Offices, January 2011-September 2018. Accessed Oct 30, 2018. While resettled refugees arrive as permanent residents and have access to various settlement and other services, refugee/asylum claimants are only eligible to receive provincially and municipally funded services such as emergency shelter and Ontario Works, not federally-funded services except for the Interim Federal Health Program. While the impacts to City services are broad, there has been a disproportionate impact on the shelter system. Since 2016, the proportion of refugee/asylum claimants using the shelter system has increased significantly. As of November 2018, approximately 40 percent of all shelter users in the City’s system were refugee/asylum claimants, which represents a significant increase over a short period; up from 11 percent in early 2016, and 25 percent in late 2017. The next largest impact has been on Toronto Employment and Social Services which provides income support services. In 2013, City Council re-affirmed its commitment to ensuring access to services without fear to residents without full status or full status documents. In 2015, City Council approved the Refugee Resettlement Program implemented by the City of Toronto’s Newcomer Office to support the large-scale resettlement of Syrian refugees to Toronto. In November 2017, City Council directed staff to develop a refugee capacity plan, in consultation with appropriate City staff, provincial and federal representatives, and community agencies. The refugee capacity plan has been developed and will be submitted in early 2019. In April and June 2018, City Council made urgent requests to the other levels of government regarding the need for a coordinated regional response to manage the increase of refugee claimant arrivals to Toronto, including a regional strategy to locate arrivals outside of the Toronto shelter system and relieve associated pressures. Back to 2018 Council Issues Notes main page.